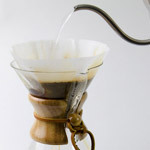 If at first glance you think that this coffee brewer has a striking resemblence to a chemistry beaker, you are correct. 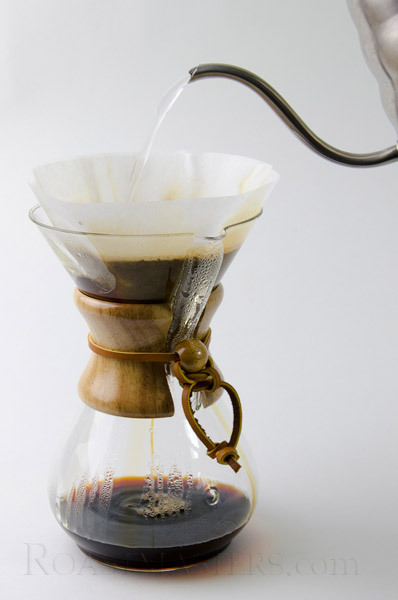 The Chemex Coffeemaker was invented in 1941 by a chemist from Berlin and his design has endured decades of ever-changing coffee brewing technology. This simple, but elegant hour-glass shaped brewer is made of heat-resistant glass with a polished wooden collar and rawhide tie. The wooden collar looks good and it also serves as an insulated handle to grasp while you pour the coffee. 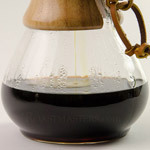 Chemex brewers are attractive and timeless - in fact, they are on permanent display at the Museum of Modern Art in NY and at other fine museums, elevating them to works of art. But, while the design of this brewer is outstanding, the coffee it brews is the real accomplishment. 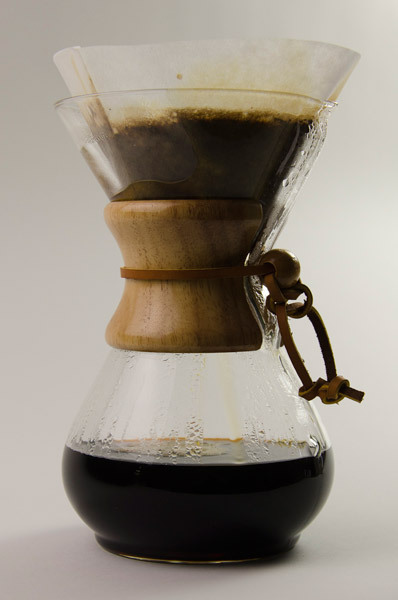 The Chemex will give you pure, clear coffee, full of flavor and absent of sediment. 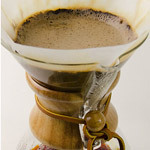 The only things the coffee comes into contact with are the nonporous glass and the paper filter. 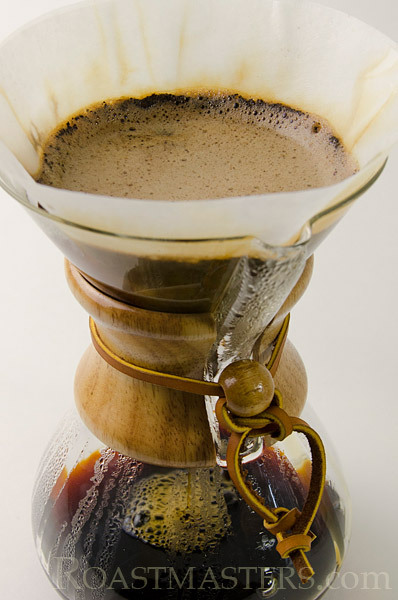 While Chemex coffee makers have been made for more than 70 years, they are today used in top coffee houses and restaurants to present high quality coffee in the best light. Used in conjunction with Chemex filters, which are heavier weight than standard paper filters, the beverage style is clean and focused. The glass is unit is one piece so the top does not separate from the bottom. Filter papers and coffee are lifted out and disposed. There is a pour channel in the glass to aid in pouring a stream to your cup. 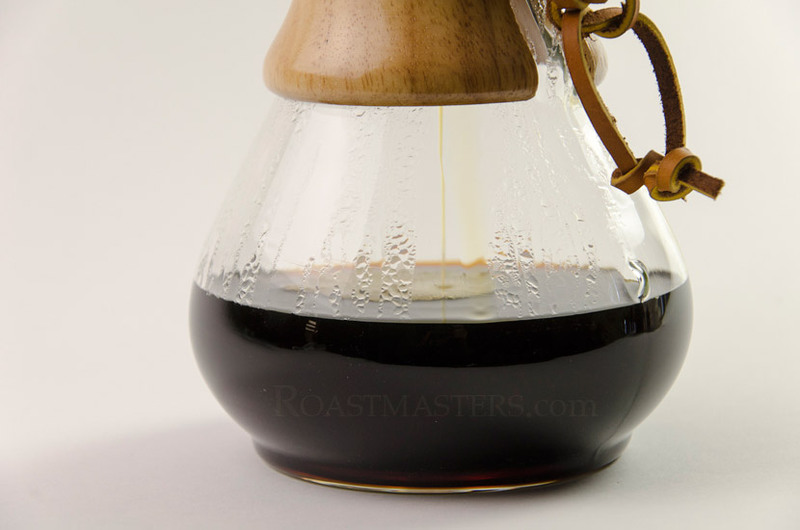 If you are looking for an easy, elegant, and historically proven method of brewing great tasting coffee, look no further. 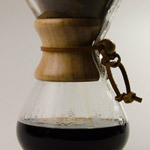 We sell Chemex products at the lowest allowable price.